Rent cut-you'll love it. We will pay the new NJ taxes! Check out our reviews. Take a Deep Breath -- You're at the Beach!!!! PLEASE - Check out our reviews. We would be embarrassed to say what some of our previous guests have said about our condo. Following are some additional guest comments taken from our written Guest Book (how quaint - we have a Guest Book that is paper and ink! ): (1) A wonderful week in this beautiful condo. (2) We have rented at different shore spots for 20 years, and this is one of the most well equipped homes we have been in. (3) Thanks for a wonderful week with great views that we enjoyed continuously from all angles. Contact us and we can tell you other guests comments and reviews (or look at our reviews on VRBO). Also - just a note - five of our guest families in 2015 were return guests in 2016, 2017, and 2018, and are returning again to 307 in 2019 to enjoy again its ambience for family vacations. More importantly for you to be aware about the above, we already have five repeat reservations for 2019. Check our calendar for open dates. WOW!!! When your family enters this oceanfront condo, you will feel the stress and pressure melt away. This 3rd floor vacation condo is new and decorated with custom, designer furniture. Park your car in one of your two parking spaces (one is covered) and walk easily to the free beaches, the restaurants and clubs, or Wildwood's other famous attractions. This is the newest and most prestigious resort in the Wildwoods. Enjoy your morning OJ and coffee or your evening cocktails on the large 3rd floor balcony in utter relaxation while listening to the surf. Take in the sun, the ocean views, the breezes, and the sounds. Be content, enjoying the pleasure of oceanfront living. Be aware, however, that the surf might drown out your conversations! This new building has secure entry and elevators. Its heated pool, huge hot tub, and sun deck are only steps away. Your vacation home has 3 bedrooms and 2 full baths, a large kitchen with gas range/stove, and large living and dining areas that open to the balcony. The balcony directly overlooks the Atlantic Ocean and the Hereford Inlet. The luxury furnishings include a large flat-screen HDTV in the living area and flat-screen TVs in the bedrooms. Your beautifully decorated vacation home comes complete with a washer/dryer. The kitchen has ceramic tile floor, premium cabinet and work space, breakfast/lunch bar, gourmet stainless steel appliances, and lots and lots (and lots and lots) of small appliances and utensils. The master bedroom has its own separate, full bathroom and a queen bed. The second bedroom has a queen bed and the third bedroom has two twin beds. A comfortable, full-size pullout sleeper sofa is in the living area. Secure your bicycles and beach gear in your locked, private storage area. Maintain your workout regimen in the well equipped exercise room with treadmills, elliptical machines, weight machines, dumbbells, and other equipment. Clubs and restaurants featuring everything from high-end cuisine to pub fare to fast food are within a couple hundred yards, as are the historic Hereford Lighthouse and its incredible Victorian Gardens with its dazzling array of flowers and plants. Nearby attractions include the free beaches, the world famous Wildwood boardwalk, Victorian Cape May, the underrated Cape May Zoo, the Wetlands Institute, numerous standard and miniature (mini or putt putt) golf courses, and nature preserves that protect and feature huge populations of shore and migratory birds and other sea life. From the balcony of your beautiful vacation home, you can enjoy both dolphin and people watching. Wave to the dolphins - they might wave back. Fishing, birding, beachcombing, golfing, tennis, basketball, sunbathing, running, walking, and biking (whew!) are anywhere from 20 yards to 20 minutes away. After your full day of vacation fun, come home to relax by the pool or on your oceanfront balcony. Ahhhhhh! Wonderful! Remember - you must speak loudly or the sound of the surf might drown out your conversations! I am a lawyer and my husband is a federal judge in Reading, PA. Our two wonderful kids are grown and out on their own. Our married son is a lawyer in Washington, DC. Our daughter-in-law is a consultant for life science companies also in Washington. Our daughter is just about done with her Ph.D. program in Behavioral Psychology at Montefiore in the Bronx. She will be interning in Manhattan in 2019-20. Her long-time boyfriend is a singer/musician/songwriter also in Manhattan. Check out our VRBO Reviews for comments of former guests in 2015, 2016, 2017, and last year. Really!! Check them out. We would be embarrassed to say such wonderful things about our condo, its amenities, and its decorations! Even more - five families who have stayed with us in past four years signed up for and will vacation in 307 in 2019. Rick and his family vacationed in North Wildwood every summer from 1952 to the present (missing only 1988) and we absolutely love North Wildwood, its free beaches, the Boardwalk, and the many delightful restaurants. His family would come here for 3 - 4 weeks each summer when he was an infant through his teen years. After that, he and I visited North Wildwood every summer except 1988. Call us and we'll tell you what happened in 1988. We all love North Wildwood and the tremendous diversity - from frenetic entertainment to complete relaxation - it offers. Nothing else is like it. Despite proximity to Entertainment District, Condo 307 is on Ocean side of condo building and is therefore immune to the noise. But don't let the sound of the surf interfere with your conversations. We are literally steps from North Wildwood's beautiful free beaches. We love sitting on the balcony as the sun rises with orange juice and coffee. We listen to the surf, and we don't mind when it drowns out our conversation. The famous Wildwood Boardwalk is a short drive (or a healthy walk) away. We are only a few steps to Flip Flopz & Tiki Topz, Anglesea Pub, Keenan, Casey's, etc., in the North Wildwood Entertainment District. But we are blessedly remote (on the other side of the condo building) from their noise at night. The Establishment and The North End restaurants are wonderful. lots of less formal quisine. We also enjoy strolls through the famous Victorian Gardens at the nearby Hereford Lighthouse. You will be minutes from the hidden gems of the underrated Cape May County Zoo, Stone Harbor Bird Refuge/Wildlife Preserve, Cape May Bird Sanctuary, Cape May itself (with its delightful Victorian architecture), historic Cold Springs, wineries, craft breweries, a llama farm, and even a new rum distillery. You are invited to walk or run on the flat, 3.0 miles +/-, seawall directly outside the condo, work out in our on-site, well-equipped exercise/fitness room, ride your bicycles all over the Wildwoods (and beyond), walk on the Boardwalk, fish right outside the condo, jet ski, parasail, golf. And, as Yul Bryner said in The King and I, "Etc. Etc. Etc." toilet, shower, jetted tub, Has twin-sink vanity. Master Bedroom Suite includes master bathroom with separate shower and jetted bathtub. Second full bathroom has tub/shower. Condo building is on the edge of North Wildwood Entertainment District - restaurants, pubs, shops galore. But we're on ocean side of building so you'll have no noise to bother you. Except the surf. Nah! We're ON the ocean! Hey! It's Wildwood! Heck yeah, it's a resort! Boardwalk, beaches, restaurants, pubs, historic sites, nature! Beachfront. Free beaches. Great views. Balcony overlooks Hereford Inlet and Atlantic Ocean. Listen to the surf, but don't let it drown out your conversations. Watch people, boats, & dolphin go by. Ocean front. Free beaches. Great views. Balcony overlooks Hereford Inlet and Atlantic Ocean. Listen to the surf, but don't let it drown out your conversations. Watch people, boats, & dolphin go by. One of our neighbors jet skied in from his home in Central NJ ! He doesn't recommend it! Marinas for jet skis are nearby. One of our neighbors jet skied in from his home in Central NJ! He doesn't recommend it! Marinas for jet skis are nearby. Waterfront. Free beaches. Great views. Balcony overlooks Hereford Inlet and Atlantic Ocean. Listen to the surf, but don't let it drown out your conversations. Watch people, boats, & dolphin go by. No telephone service. Please bring your cell phones. One covered space in garage parking lot on ground floor under building dedicated and marked for 307; one other off-street space in the condo parking lot around the building. One covered space in garage parking lot on ground floor under building is dedicated and marked for 307; one other off-street space in the uncovered condo parking lot around the building. We provide bed spreads, blankets, and pillows. We do not provide towels or linens, but linen/towel services are available for you locally. Full service fitness/exercise room: Treadmills, elliptical machines, "universal" weight machines, free-weight dumbbells, benches, etc. Condo 307 is on the third condo level, ride one of three elevators up three floors from the garage. Multiple elevators are available for your convenience. Sofa seats 3 - 4 and individual chairs seat 3. Large-screen TV. Pull out bed. Lots and lots of stuff, including a toaster. Basic spices, sugar, coffee, oils, etc. are often stocked but are at the whim of the preceding guests. Lots and lots of wine glasses, dishes, bowls, serving plates, utensils, and beer, cocktail, & water glasses. All modern deluxe appliances. Gas stove/range, refrigerator, dishwasher, garbage disposal, microwave. Dining table seats eight. Breakfast Bar for casual breakfasts and lunches. Large screen HD-TV in Living room. TV's in each bedroom. Large screen HD-TV in Living room (Comcast). TV's in each bedroom. Bose all-in-one 901 stereo AM/FM radio and CD player. Lots and lots of games, puzzles, etc. Some kids' beach toys. Some toys appropriate for guarded use inside the condo. Building is well maintained with regular landscapers. Plantings are not hugely substantial, but very attractive. OMG! Wonderful view of beach, Hereford Inlet, Atlantic Ocean, seawall strollers. Sturdy table & chairs are on balcony. Listen to the surf; don't let it drown out your conversation! Dolphin watching. None provided. Ocean kayak, canoe, and paddle board rentals are nearby. We don't provide bikes. But many, many bike rental shops are on and off the Boardwalk. None provided. Boat rentals are nearby. Heated pool and deck/patio/huge hot tub are on first floor. Tables, lounge chairs, and umbrellas provided on the pool deck. None provided. Water sports gear rentals are nearby. Really!?!?!?!?!!? You definitely have the wrong place! Nearby regulation courses and miniature golf very close. Elevators from ground level to the third condo level, where 307 is located. Master bathroom shower has three inch step-in with built-in seat. The second shower is not wheelchair accessible. Gates to the heated pool, huge hot tub, and pool deck are only a few steps from the elevator on the first floor pool deck. Guests have full access to exercise room, which has treadmill, elliptical machines, stationary bikes, weight lifting machines, and a good variety of dumbbells and benches. The immediately adjacent seawall (about 3.0 +/- miles long) has a flat top for walking and running by the ocean, while listening to the surf. Great fun to rent bicycles and ride on the nearby Boardwalk in the morning (or anytime off-season). Surf fishing and dolphin watching are only steps away. 2017 & 2018 were amazing for the number of dolphins seen from the balcony passing through the Hereford Inlet to/from the Atlantic Ocean. We hope they repeat in 2019. Many other amenities of this long-standing shore community are also available. We absolutely loved our stay!! This place is beautiful! Clean, spacious with breathtaking views! We had an amazing week! Somehow, the review is attributed to me. The folks who were our guests for the designated week stayed with us for the fourth year in a row and they are coming back next year. We were three families, 5 people in all, each with his/her own idea of what was wanted out of a vacation home-- this succeeded in making everyone happy! Spacious, clean, fully functional with a modern kitchen and responsive landlords! The balcony was perfect for watching the sunrise, the inlet and ocean and just relaxing. The place was a few blocks from the bay for a beautiful view of the sunset, and even closer to the Star Diner & Cafe where we enjoyed a number of great breakfasts and lunches. And of course we thought we had our own private beach - what could be better. Wa more can we say. We're overjoyed that her families liked it! This was my first time renting at the shore and I don't think it could get better than this!! As soon as you walk through the doors, you can feel all of your stress melting away as the unit opens up onto the breath-taking view of the ocean. This unit faces the east, so you are greeted by a beautiful sunrise every morning. Rick and Marcia make sure you have everything you could think of needing while at the shore. They also are very easy to reach if you have any questions. With all of the amenities and comfort, this unit felt like a home away from home. This location could not get any better -- it is walking distance to restaurants, Wawa, Bubba's, and the boardwalk. The staff at The Pointe at Moore's Inlet were very friendly and helpful. The pool and the gym were clean and well maintained. I would highly recommend this unit to anyone!! Our family of five would highly recommend this beautifully appointed condo!!! From the moment you walk in you see the ocean! What a sight! As a decorator myself, I really appreciated the attention to detail in the decor of this condo! So often you find just a mishmash of things thrown together in a beach rental, which can be so disappointing since this is your 'home' while you are at the beach. Not so with this property! Rick and Marcia have not only a beautiful place, but one well stocked with everything you could need and more!!! The location is perfect also- the ocean is right outside your door, as well as restaurants, and you are close enough to the 'action' of the boardwalk, yet far enough away that you don't have the noise from it. You are also just minutes away from both Stone Harbor and Cape May, two other gorgeous beach communities that we highly recommend exploring! Especially the FREE Cape May Zoo! Thanks so much for such a relaxing week at the beach! Amanda reminds me of something we neglected! We took our photos when we first bought 307. Since then, we decorated it as Amanda so graciously praises. We need to take new photos to "show off" our present décor. But in any event - thank you to Amanda. It Doesn't Get any Better than The Pointe !! This is our second year staying at this unit. The unit is beautifully decorated and maintained. Sitting on the porch overlooking the beach and inlet any hour of the day is priceless. You feel the stress being relieved the minute you walk in the front door and go thru the sliders to the balcony. The owners are great to deal with, readily respond to any questions, and maintain a beautiful, fully equipped property. The unit is so nice and relaxing, for the first time in almost 60 years of visiting wildwood, we didnt even go to the boardwalk. There are many great eating and entertainment establishments within walking distance and the unit has a fully equipped kitchen. I highly recommend to anyone. We truly appreciate all of the Reviews - we would be embarrassed to say what our Guests said! 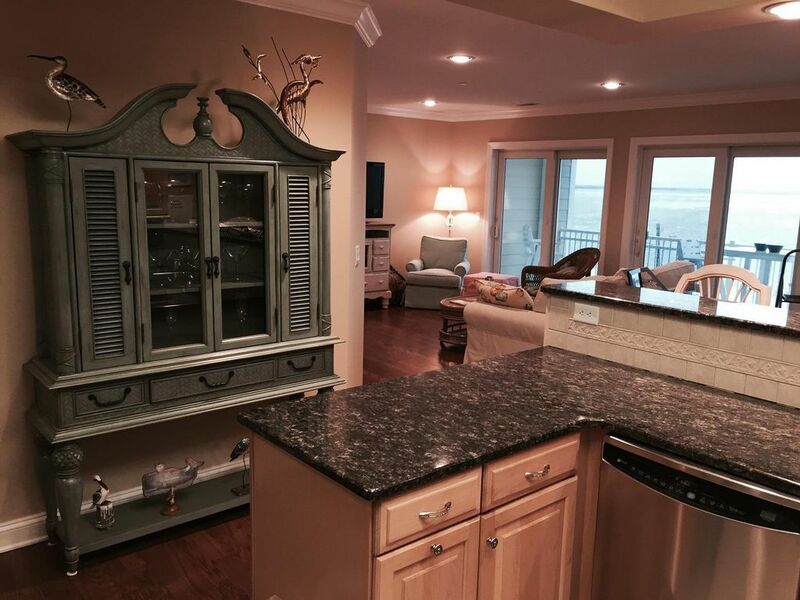 Simply a luxuriously comfortable, spacious, clean, inviting 3rd floor condo overlooking the inlet in N. Wildwood. The owners have anticipated every possible guest need with specific lists of restaurants, events, attractions, etc. However, what will bring us back regularly are the miraculous sunrises from the ample and relaxing deck- a photographer's delight. We look forward to returning often and recommending 307 to our family and friends. Check out our fabulous Reviews! Really! They say it all and frankly we would be embarrassed to say such wonderful things about our condo! Free beaches - great for cooling off, surf fishing, kayaking, paddle boarding, dolphin watching, relaxing, etc., etc., etc. Listen to the surf, but don't let it drown out your conversations! The famous Wildwood Boardwalk, with its neon lights, rides, games, honky tonk, and classic cuisine (?) is only a short mile away. Historic Hereford Lighthouse and its renowned Victorian Garden are only a couple blocks away. The vastly underrated Cape May Zoo is a 10-minute car ride. Migratory bird watching in Cape May is a 15-minute car ride. Widely recognized Wildlife Center in Stone Harbor is only 15-minute car ride. The dolphins swim into the Hereford Inlet, directly in front of your balcony. Sometimes they pass within a few yards of swimmers in the water. Wave to them - they're friendly. Miniature (mini or putt-putt) golf nearby. Great collection and diversity of night clubs, restaurants, and pubs are nearby. But they are on the other side of the building and their sound will not bother you. Historic Cold Spring Village, Cape May, Cape May Ferry, wineries, llama farm, craft breweries, and more are within 15 minutes drive. Reduced rent for extended rentals. Rates and availability are subject to change until rental is booked. Condo association assesses a $80/week administrative fee for all rentals. The fee is assessed against the guest, but the owner is obliged to collect it.